The Khanda is found on the Nishan Sahib and on the canopy over the Guru Granth Sahib Ji. The name is derived from the central symbol of a Khanda, which is a special type of double edged sword. A Khanda was used by Guru Gobind Singh Ji when preparing Amrit for the Panj Pyarey (five beloved ones). The Khanda consists of the following elements: the khanda sword, a circular Chakra, a sword on the left and a sword on the right. Represents the creative power of One God. Represents the omni presence of God and universal brotherhood. By implication the rejection of caste, ritualism, superstitions and racial and gender inequality. Represents spiritual freedom. Two edges of the double-edged sword. Represents freedom and justice. This is what the Khalsa Panth stands for. 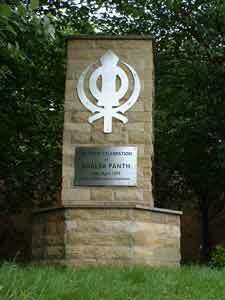 This monument celebrates 300 years of the Khalsa Panth. It is on Leeds Road, next to the Guru Gobind Singh Gurdwara.